Philemon Dickinson was an American lawyer and politician from Trenton, New Jersey. 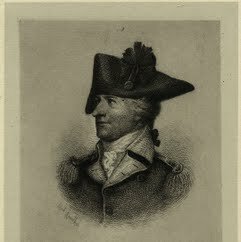 As a brigadier general of the New Jersey militia, he was one of the most effective militia officers of the American Revolutionary War. He was also a Continental Congressman from Delaware and a United States Senator from New Jersey. Dickinson was born in Maryland. When he was one, his family moved to Delaware. He was educated by a private tutor until he went to the University of Pennsylvania, from where he graduated in 1759. He then studied law, and was admitted to the bar, but never practiced. In 1767, Dickinson moved to Trenton, New Jersey. On 14 July 1767, he married his first cousin, Mary Cadwalader. They had two children; Samuel and Mary. He served as an officer during the American Revolutionary War, rising to the rank of Major General in the New Jersey Militia. In 1782 and 1783, he represented Delaware at the Continental Congress. In 1783-84 he was elected to the New Jersey Legislative Council from Hunterdon County where he served as Vice-President of Council both years. He was a member of the commission that selected the site for the national capital in Washington, D.C. in 1784.